ECB Capitulates On Defusing Eurozone's "$1 Trillion Ticking Time Bomb"
In late 2017, the ECB surprised central bank watchers, briefly spooked markets, and angered many Italians, with its plan to eradicate what many have dubbed the "ticking time-bomb" at the heart of the Eurozone, namely the roughly $1 trillion in non-performing loans across European banks (a number which is materially higher in reality as Euro banks were recently caught misrepresenting it). 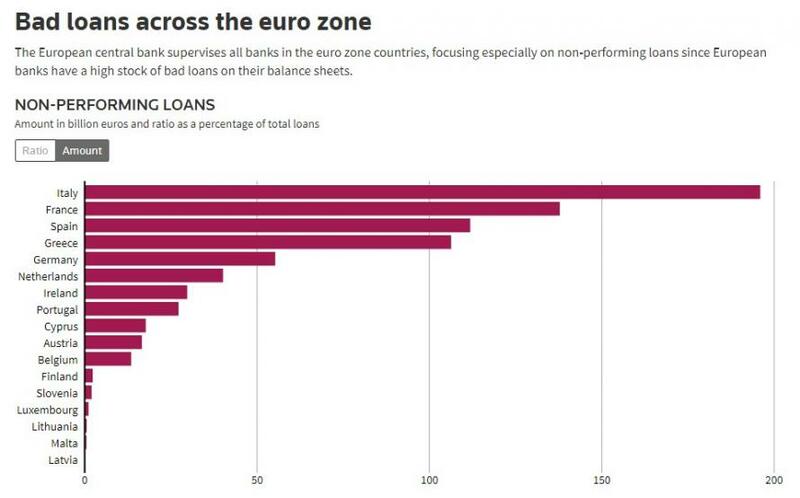 The ECB then quickly came under fire - mostly from Italy whose banks have the biggest notional amount of bad loans - for demanding that banks set aside far more capital as loss buffer for when the €900 billion in bad loans are ultimately discharged. Fast forward six months when it now appears that the European central bank came, saw... and ran away when faced with what now appears to be an certifiably insurmountable problem: as Reuters reported this morning, the ECB "is considering shelving planned rules that would have forced banks to set aside more money against their stock of unpaid loans, after suffering a political backlash." 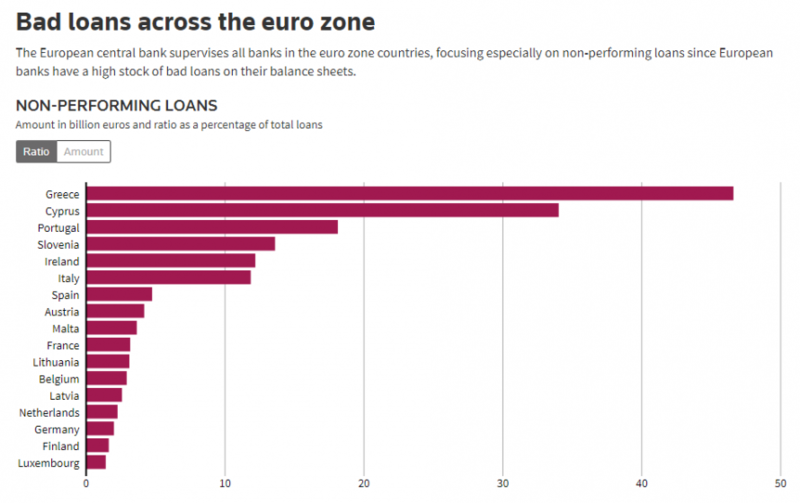 The NPL guidelines, which were already delayed by a month, and were expected by March, were pitched as a key anchor of the ECB’s plan to bring down the $930 billion pile of non-performing credit that has crippled eurozone banks for the past decade, particularly those in Greece, Cyprus, Portugal and Italy. Instead, the ECB is now planning to tactically surrender as there NPL problem has proven too massive for banks to be able to officially address it, or as Reuters put its far more politically, "the ECB was now considering whether further policies on legacy non-performing loans were necessary depending on the progress made by individual banks." Of course, since there has barely been any progress in resolving this issue, the conclusion is simple: the ECB is no longer pushing for an NPL resolution, as there simply isn't a viable one. So what will the ECB do instead to perpetuate the illusion of solvency? According to Reuters sources, if the proposed rules are scrapped - as now appears likely - supervisors will instead "continue putting pressure on problem banks using existing powers." In other words, the ECB will do nothing as matters revert to the state they were before the ECB pretended it could resolve the elephant in the European bank vault. The board of the ECB’s Single Supervisory Mechanism (SSM) will discuss the matter at a meeting next month, with a final decision expected in June, one of the sources said. Of course, an ECB capitulation means that any further financial intergation in the Eurozone would come to a screeching halt: recall that for Europe's backstop, Germany, a clean-up of banks’ balance sheets from toxic assets is the key precondition to agree on a common euro zone insurance on bank deposits. And without that, the Brussels dreams of a Federal States of Europe can never come true. So who is responsible? No surprise there: as Reuters details, the ECB received push-back on a separate set of guidelines on loans that sour in the future from several members of the European Parliament, particularly from Italy, and lobbyists. These give banks seven years to provide for new bad loans that are backed by collateral and two for those that aren’t. And while the ECB’s original plan envisaged applying similar guidelines to the stock of existing bad loans, this looks increasingly unlikely, the central bank sources said. One reason: it would require the banks to somehow raise tens, if not hundreds of billions in capital to "plug the gap." Alas, that appears impossible. Meanwhile, in a delightful reminder of Europe's uber bureaucratic chaos, lawmakers had objected that the ECB was encroaching on their prerogatives by passing rules that apply to all banks, rather than working on individual cases. Eventually, these rules on the so-called “flow” of loans that sour were unveiled in somewhat softened form last month. Of course, the problem is that by leaving matters into the hands of politicians, the problem will only get worse, something even the ECB admits: "an impact-assessment study by staff in the ECB’s monetary policy arm, which simulated the application of the “flow” rules on the full stock of unpaid loans currently sitting at euro zone banks, highlighted risks to the financial system." So what will the ECB propose intead? Well, the ECB's Single Supervisory Mechanism, which is formally separated from the rest of the ECB, has come up with a more "benign" outcome by assuming banks would continue reducing their stock of bad loans, as they have done for the past two years. In other words, the ECB will assume that the environment which started in 2016 with the ECB's launch of its corporate QE, and which pushed yields and spreads to record low levels, will persist indefinitely, even as the ECB itself also admits it will soon start tightening financial conditions, resulting in chaos in the bond market, a surge in defaults and hundreds of billions in more NPLs. The ECB could not get any more circular if it tried. That said, the good news - for bulls - is that the ECB's capitulation virtually guarantees that another episode of QE will follow shortly after the ECB "ends" the current one.